Enjoy reliable cooking performance with T-fal Ultimate hard-anodized nonstick cookware. Its innovative Thermo-Spot heat indicator lets you know when the pans are properly pre-heated—a critical component to sealing in moisture and delicious flavor, whether sautéing vegetables or searing steak. When the pattern in the center turns to a solid red spot, the pan is hot and ready to cook. The cookware’s hard-anodized aluminum construction heats quickly and offers long-lasting strength, while its warp-resistant even-heat base distributes heat evenly throughout for optimal cooking results. Use the cookware on any cook top, except for induction. PFOA-, Lead-, and Cadmium-free, the cookware’s durable Expert nonstick interior offers a health-conscious option, effortless food release (little to no fat or oil needed), and easy cleaning. The cookware's vented tempered-glass lids trap in heat and moisture, while its silicone stay-cool handles come riveted for strength, offer a secure and comfortable grip, and have end holes for optional hanging storage. 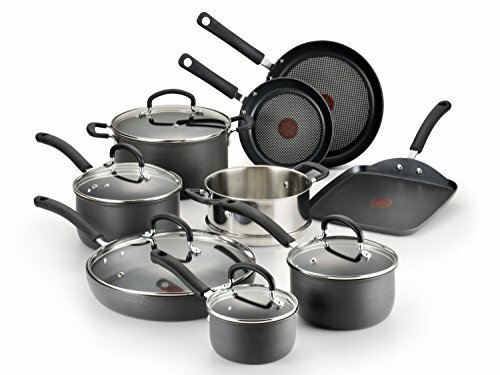 Oven safe up to 400 degrees F (lids up to 350 degrees F) and dishwasher-safe, the T-fal Ultimate 14-piece set includes 8-inch and 10.25-inch fry pans; an 11.5-inch fry pan with lid; a 10.25-inch square griddle; 1-quart, 2-quart, and 3-quart sauce pans with lids; a 5-quart dutch oven with lid; and a 3-quart steamer insert with two side handles. With T-fal Ultimate, you'll be ready for anything—from making delicious dinners during the week to cooking up a storm for the holidays or entertaining year-round. If you have any questions about this product by T-fal, contact us by completing and submitting the form below. If you are looking for a specif part number, please include it with your message.